South Africa's Daryl Impey of Orica-GreenEDGE outsprinted top Canadian Ryan Anderson to take a 10 second time bonus that catapulted him past five-day race leader Tom Dumoulin of The Netherlands and Team Giant-Shimano to win the Tour of Alberta, presented by ATB Financial, by a mere one second after 738 kilometres of racing. 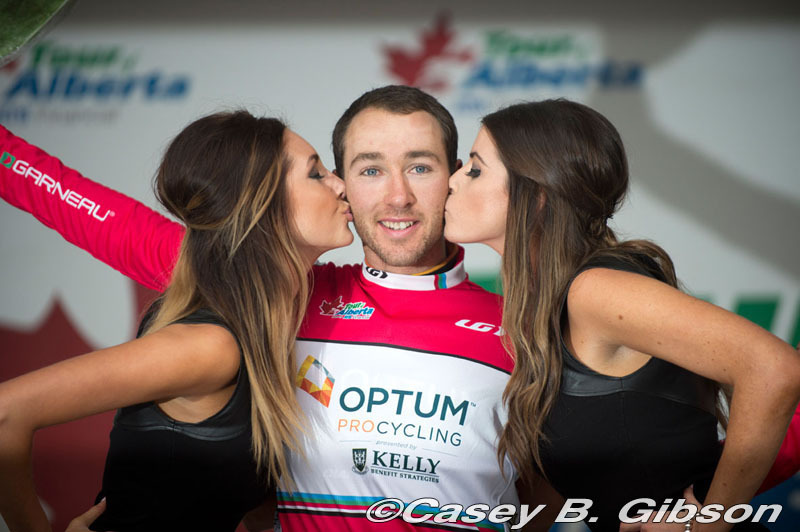 Impey, who was a last-minute substitution on his team for the race and coming off a two month ban that was lifted, entered Sunday's final stage in Edmonton's Centre City nine seconds behind Dumoulin, who had led the race since the Prologue in Calgary this past Tuesday. There were time bonuses of 10, 6, and 4 seconds, respectively, for the top three places on the final stage. By winning, Impey gained 10 seconds while Dumoulin failed to place in the top three, thus giving the South African a win that wasn't determined until the final metre of the race. Anderson almost spoiled Impey's victory by outsprinting him and eliminating him from the four crucial seconds he would need to overcome Dumoulin. 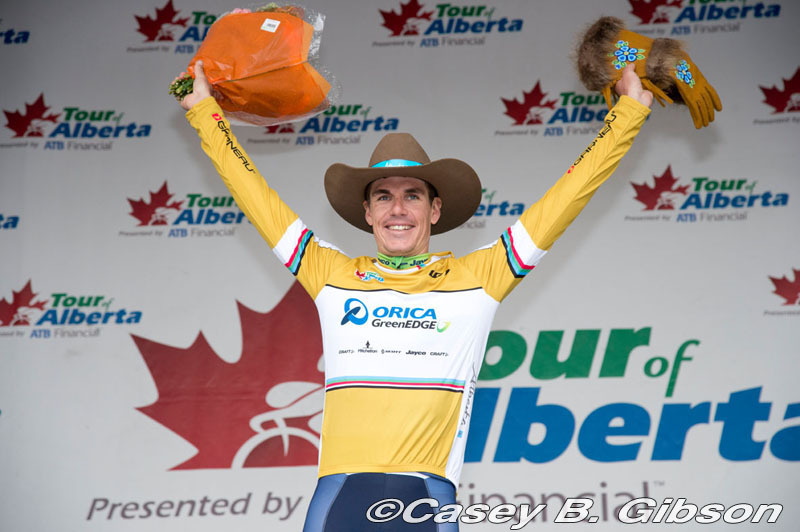 "After everything I've gone through, this victory is very rewarding," said Impey, who had a suspect doping charge dropped only four days before arriving in Alberta last week. "My team did an incredible job getting me the best position to sprint for the win." For the 23 year old Dumoulin, it was the third race this year that he lost on the final day. someone defeating him today," he said. "When I saw his hand lifted in victory, I couldn't believe it." Dumoulin most recently had been winning the Tour of Belgium and Eneco Tour before being overcome on final day of the race. Anderson was in the same boat as Dumoulin, motivated to win the stage in his hometown of Edmonton while also using the time bonus to move into second place overall. Instead, Impey made a bold move to pass Anderson in the final 50 metres and Anderson was forced to ease his sprint near the line to avoid a crash. "It seemed like he (Impey) took a hard line and I was pinched to his right against the barrier," Anderson said. "He obviously had more to gain than I did. It would have been good to get the stage win and I think it might have put me on the podium." and a longer, more gradual climb up Victoria Park Rd. The Netherland's Steven Kruijwick of Belkin Pro Cycling went clear midway through the race and at one point had more than 1 minute, 30 second lead and was the virtual leader on the road. He was reeled in by a group of more than 30 riders, led by Garmin-Sharp, who won the team competition. The final podium included Impey, Dumoulin at one second behind, and 21 year old German Ruben Zepuntke of the Bissell Development Team. He said the podium was the biggest result of his career and "a big achievement against World Tour" riders. The race was the fastest of any major North American race this year, as the peloton averaged 45.6 kilometres per hour (28.77 mph). "A lot of teams came motivated to win," said Ramunas Navardauskas. "It was a fast race despite the winds and rain." "This was a very good race," said Impey. "It has become important for us. It's organized well and well attended by the fans. We look forward to coming back." The Subway Sprint Points jersey winner was Lithuania's Navardauskas of Garmin-Sharp. The Go Auto King of the Mountain was Great Britain's Simon Yates of Orica-GreenEDGE. The ATB Financial Best Young Rider was Tom Dumoulin of Team Giant-Shimano. The Pomeroy Hotel & Suites Best Canadian winner was Ryan Anderson of Optum p/b Kelly Benefit Strategies. The top rider on the Canadian National Team was Hugo Houle, finishing the race in 22nd place on the general classification. Houle finished 14th on Saturday and 17th on the last stage. 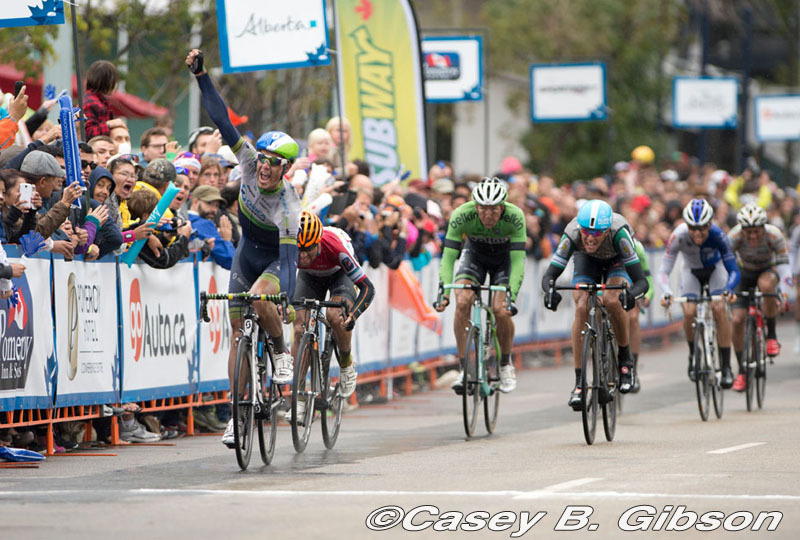 Team director Gord Fraser is happy with the outcome for the Cycling Canada Tour of Alberta project. "For the Canadian Team, it was a great week for the development of our young riders. Hugo Houle got some much-needed race time to prepare for the finish of the season. Garrett McLeod continues to improve and has narrowed the gap to being a top professional. Ben Perry got a taste of elite level racing, and our U23 National Champ held himself well in the company. Jean-Sebastien Perron continues to battle and provide good help to his teammates. He has piloted some Para tandems this year and hopefully he continues to help Canada gain medals in this important discipline. Stuart Wight is a savvy rider and is also progressing at a nice rate. For Adam, Jordan and Cody, they will take home with them great lessons and hopefully apply them to their training and racing going forward in the future." "We'd sincerely like to thank race organizers Medalist Sports, the Province of Alberta and ATB Financial for supporting the event as well as the staff and volunteers who made it a safe race for all. Thanks also to Global Relay for supporting our National Team. Hopefully, we'll be back again next year to help our athletes achieve their goals," added Fraser. 28 Fabian Wegmann (Ger) Garmin Sharp all s.t. 32 Michael Woods (Can) 5-Hour Energy all s.t. 39 Theo Bos (Ned) Belkin Pro Cycling Team s.t. 47 Jonas Ahlstrand (Swe) Team Giant-Shimano all s.t. 73 David Tanner (Aus) Belkin Pro Cycling Team all s.t. 10 James Oram (NZl) Bissell Development Team s.t. 16 Dion Smith (NZl) Hincapie Sportswear Development Team s.t. 19 Simon Yates (GBr) Orica GreenEDGE s.t. 38 Georg Preidler (Aut) Team Giant-Shimano s.t. 46 Jonas Ahlstrand (Swe) Team Giant-Shimano s.t.